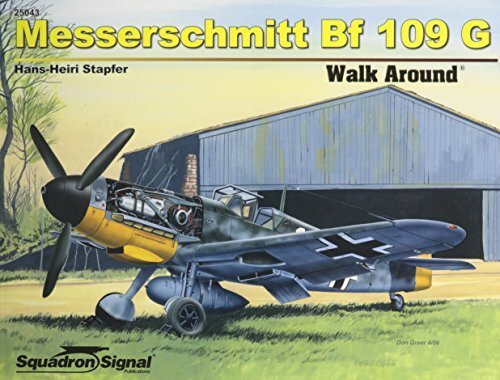 Messerschmitt Bf 109G (Walk Around) est le grand livre que vous voulez. Ce beau livre est créé par Hans-Heiri Stapfer. En fait, le livre a 80 pages. The Messerschmitt Bf 109G (Walk Around) est libéré par la fabrication de Squadron Signal Publications. Vous pouvez consulter en ligne avec Messerschmitt Bf 109G (Walk Around) étape facile. Toutefois, si vous désirez garder pour ordinateur portable, vous pouvez Messerschmitt Bf 109G (Walk Around) sauver maintenant. Commonly known as the Gustav because of the G suffix in its name, the Bf 109G began rolling off assembly lines in February 1942 and remained in production until the end of WWII. The Bf 109G was mainly distinguished from its predecessor by the fact that it incorporated the Daimler Benz DB 605 A engine, a powerplant with a takeoff rating of 1,475 hp, 125 hp more than the DB 601E engine in the Bf 109F-4. Production of the Bf 109G was also undertaken by Germany’s allies, including Romania and Hungary. No reliable manufacturing statistics survive, but it is estimated that 23,000 Gustavs were built by the end of the war. This volume recounts the stories of the numerous versions of the versatile Gustav, including the G-1 and G-5 with their pressurized cabins; the prolific G-2 and G-4, which saw extensive service on the Eastern Front and in North Africa; the G-6, which was built in greater numbers than any other Gustav; the short-range reconnaissance G-8; and others. Particular attention is devoted to Gustav aircraft flown by Germany’s allies during the war, including wartime photos of Croatian, Finnish, Hungarian, Italian, Romanian, Slovak, and Slovenian pilots and their aircraft, highlighting a facet of the Axis war effort often overlooked by historians.